The book cover was not in the original blog. Here it is from the Annie Jaocbsen website. After listening to a radio interview this morning, apparently I am a year late, for the hardbound release. 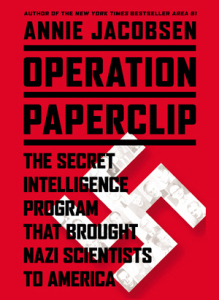 I understand that the paperback is released today for the book Operation Paperclip. I went to the website to catch up. This topic was not new to me, but perhaps was last year to many of her fans. This is January 21, 2015. While listening to the interview this morning, I missed the beginning of it with her. At first I thought she was Linda Hunt on the air, because of her book Secret Agenda [ St Martin’s Press, 1991]. Too, she mentioned things that I had not read or heard before, those being her interviews and the cold war years as “dark times” comments, that were “like now” and as there were “real unanswered questions” then , so are there now.